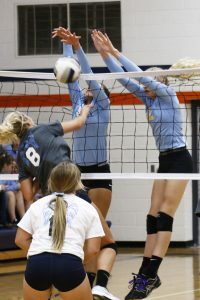 The Lynnville-Sully volleyball went 1-1 in conference play during the past week, dropping a match to HLV but recovering with a solid 3-0 win over Colfax-Mingo. Despite winning the first game at Victor on Tuesday, Sept. 6, the L-S girls dropped the SICL match, 3-1: 25-22, 24-26, 19-25, and 19-25. The Hawks led for the majority of the first game. The final point was credited to senior Camryn Russell when she rose up to block a kill attempt and succeeded. Russell led the team in solo blocks with four. Shiloh Cunningham and Mallory Loftus deny a Colfax-Mingo attack on Monday night in Sully. The Hawks also led for most of the second game, but let it slip away from them in the end. From there, the Warriors carried momentum into the last two sets and finished the night with a win to move them to 3-0 on the season at that point. L-S had a strong night of serving from seniors Skyler Young and Russell. They each had 100 percent serve efficiency and three aces. Other athletes who made all their serves included senior McKinley Conover and sophomore Janelle Rozendaal. Junior Shiloh Cunningham led the team in aces with five. The Hawks landed 94 percent of their serves, which was good enough for a season high in serve efficiency. The leaders in kills on the night were sophomore Mallory Loftus and Conover with five each. The leader in digs was Conover with a total of 11. Junior Carson Fisk had seven and junior Makayla Rozendaal and Russell had six apiece. Colfax-Mingo gave the Hawks a run for the money on Monday, Sept. 11, but the Hawks were able to shut down the host Tigerhawks in just three games: 25-21, 25-23, and 25-30. Fisk not only led the Hawks in serves, making 23 of 24 with three aces, she also went on a long service streak in the second set to help the Hawks establish a 14-4 lead. They would eventually claim the game, 25-23. The L-S girls made 80 of their 89 serves (90 percent). Other top servers were Russell (16 of 17), Conover (15 of 17), and Young (13 of 14). Loftus put down 10 of the team’s 23 kills. Conover led the team in digs with 18, followed by Fisk’s 15. Loftus and Cunningham were credited with six and five blocks respectively. L-S is now 3-6 overall and will be at BGM (0-14) on Thursday. The Hawks are also scheduled to be at a Saturday tournament at North Mahaska. They’ll be at home for the first time this month on Monday, Sept. 18, hosting No. 13 Montezuma (14-3).